Who would be vulnerable in a Fujifilm Xerox merger? We think it's fair to speculate that most observers outside of Xerox (maybe many inside as well) are skeptical the proposed business combination with Fuji Xerox will be likely to make a difference. We previously formulated the argument that the new Xerox must increase revenues at 5% per year to have a chance of supporting an ongoing 13X multiple on its share price. This means Xerox must win more than $3.5B of new business over the next four years to satisfy investors. Part I - Will the Fuji Xerox acquisition of Xerox make a difference? Part II - Where's the upside in the Fujifilm deal to combine Fuji Xerox and Xerox? Part III - Who, if anyone, is vulnerable to lose market share to the new Xerox? We're motivated to close out our three-part series with an objective assessment of the marketplace players and their financial strength and to place this alongside a subjective assessment of their capabilities. Our goal is to see if any compelling, non-obvious, upsides emerge that could turn the skeptics on their heads and point us all in the direction of an improved outlook for a beleaguered business. Most of the content we're presenting here is based on the financial performance of each of the businesses Xerox competes with, their balance sheets, their respective product and service offerings, and their overall business strategies. Our goal is to see if we can identify which (if any) of these competitors may be vulnerable to collectively giving up the $3.5B of business that Xerox needs to achieve respectable financial goals. 1. The market, as we're traditionally inclined to define it, may be declining at 5% or more per year but the overall market outlook should be looked at differently. Although pages printed may be declining significantly, it's possible that revenues generated from service related offerings may compensate for the decline in print-related transactional revenue. 2. For a participant to stand a chance of success in the market, a sophisticated suite of hardware, supplies, and services related offerings must be made available. A comprehensive MFP hardware portfolio. Device ecosystem (hardware plus software and services). Channel specific solutions - i.e. medical, legal, etc. Associated offerings for MPS, Managed IT, Managed Document Systems, Workflows, and Security. Current and historical standing in terms of market share. 3. We have referenced a February 2018 MarketScape analysis conducted by IDC to help understand the capabilities and strategies of the market's 13 primary participants. We are using this report as an authoritative source for the basis of ranking the market participants in terms of their capabilities and strategies. 5. A transactional business proposition is far more easily attacked than a services oriented business. For example, all the players in the A3 space have hardware and software based ecosystems. Once a client is established on one of these ecosystems it becomes painful for a change to take place. The larger a business - i.e Canon, Xerox, etc., the more clients they have on their ecosystem that it then becomes very difficult for competitors to convert to an alternative ecosystem. Therefore, changes from one vendor to another are increasingly difficult and, unless there's a significant breakthrough in terms of technology that compensates for the pain involved, it becomes less likely for significant changes in market share to take place. Debt capacity is directly related to profitability because, the greater the debt capacity, the greater the underlying profits must be. Debt may be used as a vehicle to finance channel development (new products, new sales channels, acquisitions, etc.) if current cash flow (profits) are being utilized elsewhere. Basically, as a guideline to interpret the charts, the larger the bubble, the closer it is to the vertical axis, and the higher the position it occupies on that vertical axis, then the stronger the business and the better positioned it is to win market share. There is one outlier: Dell Technologies - the largest in terms of sales revenue and market capitalization, but also the largest in terms of debt, and the weakest in terms of its value proposition necessary for success in the channel. Once again, there are three clusters. 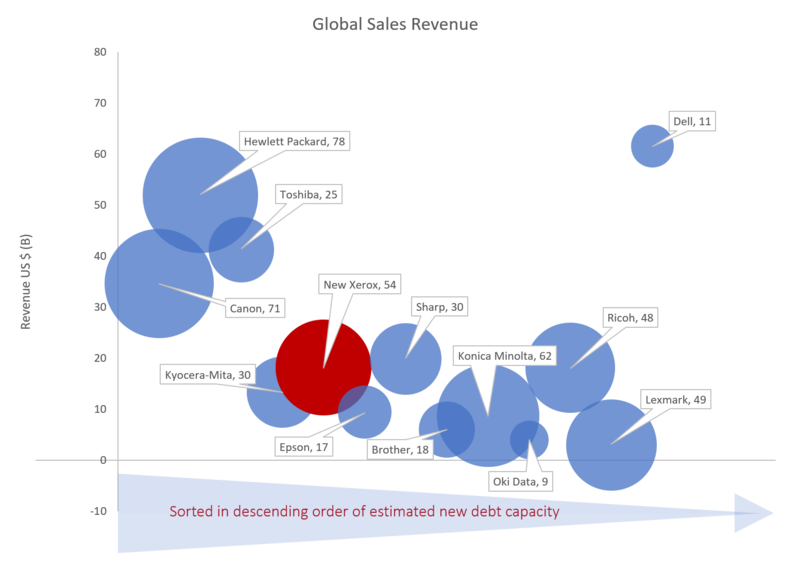 The only significant change from the sales revenue chart is the movement of Toshiba from the first to second cluster. This reflects the impact on their share price that has resulted from recent woes associated with their nuclear power plant business and the Westinghouse Electric bankruptcy. 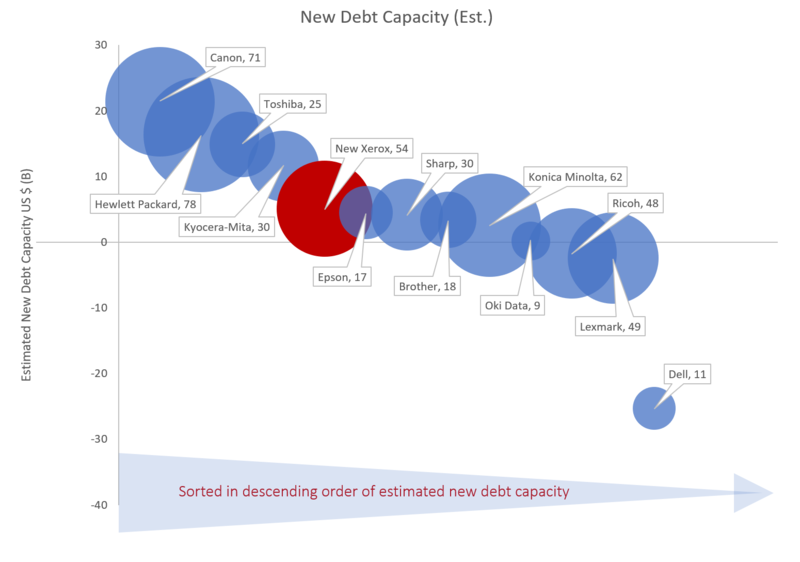 Debt may or may not be used to fund sales channel development but debt capacity is a useful indicator of the financial strength of a business. This, in turn, is an indicator of how well a business may be positioned to compete for market share. Although we don't see the same three clusters in this chart, it's still helpful to see the relative strength of the different market participants. For example, Toshiba has plenty of debt capacity, some of which could (in theory) be allocated to improve its value proposition (25) and its sales channel development. The same is true for Kyocera Mita (30) and Epson (17). 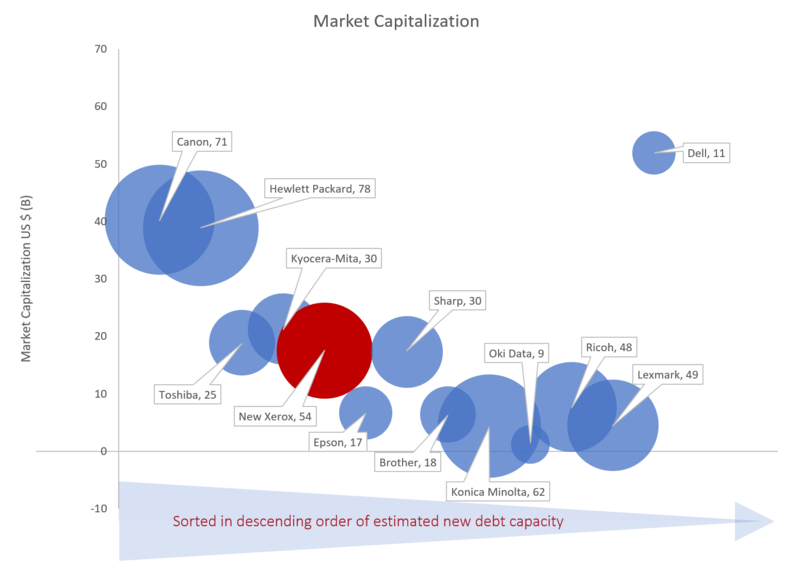 Conversely, Konica Minolta (62), Ricoh (48), and Lexmark (49) may all be weaker in terms of debt capacity, but each of them already have relatively strong value propositions. Hewlett Packard has announced its intention to enter the A3 space where they're purported to currently have a 2-3% share of a $55B market. If they can win a 10% share by 2020 (even if the market's declining at 5% per year) then it will be a $4.7B channel for them in 2020 compared to $1.4B today. This represents $3.4B of incremental sales that helps protect their top line from declines that may be taking place elsewhere (i.e. A4) in their business. Remember, with Hewlett Packard's acquisition of Samsung's printer business they are no longer shackled to Canon. They have complete control of product development and the value chain and there's no longer any margin to share with Canon. This acquisition is likely to improve their competitive standing. When also combined with the possibilities for growth from the developing 3D industrial printing opportunity, it's not difficult to understand how HP is more likely to continue to grow its top line than most of its competitors. There are skeptics who doubt HP's ability to break into the A3 market. They may have good reason for skepticism as the major players already have their customers embedded on their ecosystems and (as we've already said) it takes a strong proposition and considerable time to persuade anyone to switch. However, despite this barrier, what we can be sure of is that HP will be competing strongly for share, leveraging their "best-in-class" value proposition as well as their financial strength to attempt to achieve their objectives. Time will tell whether these attempts will be successful. So, HP will be attempting to win $3.4B in new market share and Xerox needs to increase its sales by $3.5B. Between the two, that represents nearly $7B of market share shift - probably more than 15% of the projected US 2020 market! Based on the obstacles faced to convert a customer from one ecosystem to another, it's difficult to believe a shift of this scale will take place. Furthermore, it's not just HP that Xerox has to worry about. Look at the other players in the cluster surrounding them. Take Epson and Kyocera Mita for example. Both are contenders, neither has as strong a value proposition as Xerox but they will continue to chip away to try and achieve their business objectives. As they do so, they'll probably erode some of Xerox's margins, and maybe win a few customers here and there. Between them, there's plenty of cash available that could be used to fund channel development. Then look at the third cluster where, although there's less cash available, there are some strong players in terms of their value propositions - particularly Konica Minolta, Lexmark, and Ricoh. Each of these will be continuing to work hard to build their market share. The bottom line is that Xerox is surrounded by hungry competitors all looking to increase market share just as they are. However, not everyone can increase market share at the same time and there doesn't appear to be any obvious avenues pointing to a Xerox advantage that will help them do so over the others. In March 2017, Xerox announced the largest new product launch in its history with the introduction of 29 ConnectKey® enabled printers and multi-function devices designed to transform the workplace. Xerox needs at least $3.5B of new revenue by 2020 to satisfy investors. They're already a major player (perhaps market leader) in the A3 channel and HP is entering the space with an intent to compete with them. Some of the growth they are planning for, if successful, is likely to be at the expense of Xerox. We don't believe the launch of 29 new products will be sufficient for Xerox to significantly increase market share. So, what other options does Xerox have to grow revenue and increase market share? Global Imaging Systems - according to the GIS website, there are currently 40 core businesses with an additional 174 satellite locations. A business Xerox acquired for $1.5B in 2007 which, at that time, had just over $1B in sales. We don't know how much organic growth or the subsequent acquisitions have increased sales since then, or how important future acquisitions may be to the core Xerox strategy. However, Xerox could attempt to accelerate their GIS acquisitions as a growth initiative. Remember though, they need $3.5B in new sales. Assuming the average business they'd target had $20M in sales then they need to buy 175 dealerships. Let's assume they cost 1X revenue each, then they have to spend $3.5B. Let's assume they pay 50% cash and the balance of the transaction is Xerox stock, then they'd have to allocate $1.75B to fund the initiative. On the face of it, over a 4 year period, the funding required to execute a strategy along these lines should be well within their scope. However, as we all know, it's not so simple! With this level of demand, the price would increase and Xerox would probably be forced to over pay. There would be doubts surrounding Xerox's ability to make a success of the long-term strategy, doubts that would cause owners to be reluctant to invest half their equity in a non-growth stock. It's more likely, for those dealers inclined to sell at all, that they'll look at the Dex Imaging or Flexprint roll-up models before seriously considering Xerox. Toshiba has been dealing with some major issues associated with its Westinghouse Electric subsidiary, liabilities associated with its nuclear power plant construction business, a $6 billion write down due to cost overruns, and a subsequent bankruptcy filing for the Westinghouse subsidiary in March 2017. It's possible Toshiba could be open to divesting its print business which must be small fry in the context of a conglomerate with $43B in annual sales (down 27% since 2015). Sharp, a $20B a year company with five consecutive years of losses, has had to deal with its own set of issues that culminated in a $3.5B sale to Taiwan based Foxconn Group in March 2016. Foxconn, the world's largest outsourcing assembler for many of the world's best known brands, could be open to divesting its print business - a complicated business model based on services related sales that's hardly in their sweet spot of core competencies. Ricoh has also had its fair share of problems, most notably the Ricoh India accounting fraud in 2015-6. Nearly 80% of Ricoh's $18B or so in annual revenue comes from the Office Printing and Office Services segment and, despite a hefty debt load of around $8B, the top line is stable and the business is profitable. Unlike the potential for Toshiba or Foxconn to offload a business segment, it would take an outright sale of the entire Ricoh business to get a deal done. With a market cap around $7B and with a 6X multiple on TTM EBITDA of around $8B, a deal could be feasible for the new Xerox to undertake but, it seems unlikely the Ricoh Board would be under any pressure to do so without a significant premium being involved. Besides it's biggest ever new product launch in 2017, Xerox doesn't have a new product category in the way that HP (for example) has a market-leading, industrial 3D printing product offering with the potential to deliver a significant growth in sales. Digital presses, digital-on-demand printing, industrial printing services are other areas where Xerox has a significant presence. These are large markets but they're also very competitive and Xerox is up against major players including Hewlett Packard, Kodak, Ricoh, etc. Xerox would find it very expensive and (we think) very high risk to try and compete in the A4 space. They tried this years ago with their ink jet initiative and failed. The risk of failure was high then and it's likely to be even higher now. Unlike HP, which has a viable strategy to move into the A3 space, we really don't think Xerox has one that would successfully move into the A4 space. Perhaps if they'd purchased Lexmark a couple of years ago but not from where they are at today. Could Xerox attempt to expand the market for its solutions based business model outside the traditional mid and large-cap business boundaries? Perhaps the most effective way for them to attack HP's A4 base would be to figure out a way to offer the services related model to SME's. However, trying to get the (relatively) unsophisticated small business owner thinking about managed IT, changed workflows, managed document systems, etc. and then signing up for multi-year service based contracts, is a tall order. There's a good reason there's a relatively natural boundary around the type, and size of company that entertains this kind of offering! It will take some bold moves by the Xerox management to implement and execute strategies that will make a difference. Outside an acquisition of a competitor like Toshiba, Sharp, or Ricoh, we think their options to grow the business are limited. However, going down the acquisition path is also fraught with operational risk compounded with the implications of impatient shareholders and their low tolerance for risk. It's one thing for Michael Dell to take the company he founded private, using mostly debt to finance the deal and then, a few months later, do a massive ($67B) deal to acquire another company (EMC) and, in so doing, take total debt to more than 12X EBITDA. The tolerance for risk at Dell in a PE environment is much higher than it's likely to be for the new Xerox and its stakeholders. Only time will tell if the Xerox management have the vision and fortitude to pull off the kind of major moves required to transform the business, or whether we'll continue to see a series of conservative steps that fail to arrest the ongoing deterioration. Make sure you don't miss out on our upcoming content - use the button below to sign-up for our blog! The challenges created by the changing business conditions are no different for a big business like Xerox and a smaller business like a dealer reselling Xerox products. Big or small, a digital transformation strategy is necessary to survive. See where you stand in your digital transformation by downloading our Analog Vs. Digital evaluation template. Once an integrated technology platform is established, then start to have some fun transforming your business, as you leverage technology alongside your personality in your market.